There are 18 publications for Full employment policy. One of the main contributions of Modern Money Theory (MMT) has been to explain why monetarily sovereign governments have a very flexible policy space that is unencumbered by hard financial constraints. Through a detailed analysis of the institutions and practices surrounding the fiscal and monetary operations of the treasury and central bank of many nations, MMT has provided institutional and theoretical insights about the inner workings of economies with monetarily sovereign and nonsovereign governments. MMT has also provided policy insights with respect to financial stability, price stability, and full employment. As one may expect, several authors have been quite critical of MMT. Critiques of MMT can be grouped into five categories: views about the origins of money and the role of taxes in the acceptance of government currency, views about fiscal policy, views about monetary policy, the relevance of MMT conclusions for developing economies, and the validity of the policy recommendations of MMT. This paper addresses the critiques raised using the circuit approach and national accounting identities, and by progressively adding additional economic sectors. Although Hyman P. Minsky is best known for his ideas about financial insta­bility, he was equally concerned with the question of how to create a stable economy that puts an end to poverty for all who are willing and able to work. This collection of Minsky’s writing spans almost three decades of his published and previously unpublished work on the necessity of combating poverty through full employment policies—through job creation, not welfare. 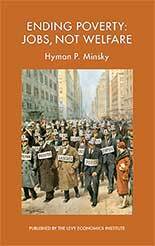 Minsky was an American economist who studied under Joseph Schumpeter and Wassily Leontief. He taught economics at Washington University, the University of California–Berkeley, Brown University, and Harvard University. Minsky joined the Levy Economics Institute of Bard College as a distinguished scholar in 1990, where he continued his research and writing until a few months before his death in October 1996. His two seminal books were Stabilizing an Unstable Economy and John Maynard Keynes, both of which were reissued by the Levy Institute in 2008. This book was made possible in part through the generous support of the Ford Foundation and Andrew Sheng of the Fung Global Institute. In most economies, the potential of saving energy via insulation and more efficient uses of electricity is important. In order to reach the Kyoto Protocol objectives, it is urgent to develop policies that reduce the production of carbon dioxide in all sectors of the economy. This paper proposes an analysis of a green-jobs employer-of-last-resort (ELR) program based on a stock-flow consistent (SFC) model with three productive sectors (consumption, capital goods, and energy) and two household sectors (wage earners and capitalists). By increasing the energy efficiency of dwellings and public buildings, the green-jobs ELR sector implies a shift in consumption patterns from energy consumption toward consumption of goods. This could spur the private sector and thus increase employment. Lastly, the jobs guarantee program removes all involuntary unemployment and decreases poverty while lowering carbon dioxide emissions. The environmental policy proposed in this paper is macroeconomic and offers a structural change of the economy instead of the usual micro solutions.